Home » Motorcycle Industry » What Makes Café Racers Special? The motorcycle marketplace is a conundrum. With so many specialized bikes on showroom floors, it is strange how vaguely homogenized the market seems. Tourers, ADVs, dual sports, standards – they’re all so alike. That’s where the classic café racer stands alone. It is a glimmer of individuality in a world of increasing sameness. Café racers exude retro cool in a way that no purpose-built factory bike can manage. They have achieved a cult following over the decades since their first appearance, ostensibly in 1960s England. These machines are built for the short haul, intended to get from points A to B as quickly as possible, without concern for rider comfort. But any modern sportbike can achieve that. What is it that makes café racers cool? While builders usually try to improve the power of their café racers, raw speed is not necessarily a requisite for these machines. Many café racers are built on now-antiquated designs, underpowered by today’s standards. Single- and twin-cylinder engines with displacements under 500 cubic centimeters are common choices for café racer builds, despite these bikes’ modest power output. Rather, these builds evoke speed through design. Dropped bars and rear-set pegs are part of the equation, as is an elongated fuel tank. Seat cowlings often complete the look. It is not until the rider is situated in the cockpit though they the look of speed is complete. These are bikes that need their owners. Few of these design elements exist for completely aesthetic reasons. Most evolved over time because of the needs of riders customizing their bikes. Café racers have a look that is unmistakable. The uninitiated can pick one out of a crowd, even if they can’t explain why. That look is the result of countless riders improving the handling of their own machines. Café racers evolved to improve aerodynamics, reducing the wind buffeting that slows progress and makes inputs feel clumsy. Clip-on bars and rear-sets produce an aggressive riding position, placing the rider’s weight forward, in the ideal position to get the most agility possible from the machine. The result is ideally a bike that handles curves far better than it did in stock form. Aesthetic beauty is a side effect. Builders typically wring every last ounce of power hiding within their machines. Performance upgrades are the norm in this genre, as are modernized electronics. Ignitions are often made electronic if they weren’t already, and stators are often beefed up to provide a hotter spark. As many of these bikes are carbureted, jet kits and high-flow air filters are common mods. Another common modification is aftermarket pipes, which are often necessary for ground clearance as much as power delivery. Freely aspirated, classic café racers often realize significant power improvements. They also typically achieve exhaust notes that modern motorcycles rarely exhibit in stock form, especially in today’s decibel-averse world. At the end of the day, what makes café racers cool is less about what they are, and more about what they are not. These bikes are not common. They are not cliché. They aren’t same. These are the steeds of iconoclasts. Unless you join a riding club, you aren’t liable to see many bikes like yours on the road, and you’ll never see a carbon copy of it. 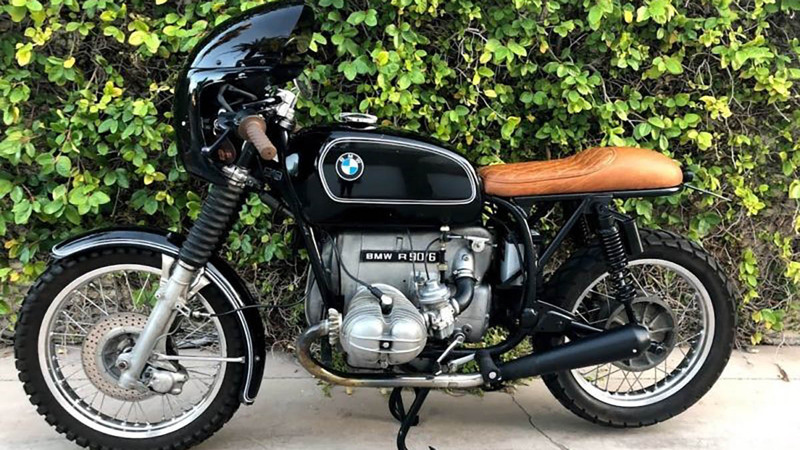 Check out the machines on caferacerforsale.com if you are interested in becoming part of the elite company of custom café racer owners. Careful though. You’re liable to get hooked.